Punjab Pradesh Congress president Capt Amarinder Singh may be on his way out but his camp is digging in its heels to ensure a “suitable” replacement other than Gurdaspur MP Partap Singh Bajwa and Congress Working Committee member Jagmeet Singh Brar. Sources say the Amarinder camp is making efforts to persuade the high command to either appoint a consensus candidate or a working president under Amarinder to take care of day-to-day affairs. Ludhiana Municipal Commissioner Malvinder Singh Jaggi has been suspended after a speedy one-hour inquiry by Punjab DGP Sumedh Singh Saini found him guilty of gross misuse of power in demolishing the shop of a vegetable vendor who did not “attend to his wife properly”. 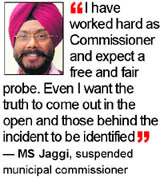 Malvinder Singh Jaggi, a 1992-batch PCS officer, was made Commissioner in December 19 last year. A non-controversial and a polite officer, his suspension has come as a shock to many. Chief Minister Parkash Singh Badal today approved the Rs 10,300 crore Ludhiana Metro project, which will be completed in five years. A detailed presentation on the project was made by the Local Government Department and Punjab Infrastructure Development Board in a meeting here, an official release said. With yet another recovery of contraband from a cement cargo from Pakistan coming to the fore, Indian importers have sought stringent measures to curb the trend that is posing a threat to the future of the cement import business. Punjab’s Housing and Urban Development Department is “outsourcing” land acquisition for future projects in Chandigarh’s periphery. Propriety in spending government funds has come under question with the Punjab Home Department not clearing a file raising bills of more than Rs 81 lakh spent on the renovation of the preceding DGP’s official residence in Sector 16 here. Patiala District and Sessions Judge Raj Shekhar Attari, Deputy Commissioner GK Singh and Nabha SDM Poonamdeep Kaur visited the high security jail here today. They listened the grievances of inmates and planted trees on the jail premises. To solve the problem of choking of sewerage pipes and waterlogging, Punjabi University has approved the setting up of a sewage water treatment plant worth Rs 1.70 crore. The plant is likely be commissioned within eight months. The Punjab and Haryana High Court has transferred the infamous diamond heist case to Faridabad, ruling that the “ever-obliging” cops could hardly be expected to act independently when the prime accused was their senior officer’s son. Acting on a bail petition by Punjab MLA Bibi Jagir Kaur for enabling her to vote in the Presidential poll, the Punjab and Haryana High Court today issued a notice to the CBI for Wednesday. The Ludhiana Central Jail Superintendent has been issued a charge sheet after a probe confirmed that an undertrial was beaten by two Head Constables. As punishment, the Head Constables had been denied two increments. A local woman and her husband, both NRIs, along with their son have been booked by the Moga police allegedly for forging documents to get passports issued. The district police claim to have solved a three-year-old double murder mystery with the arrest of three persons. 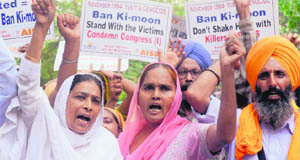 The accused had killed their friends belonging to Jalandhar in 2009. Bajwa does not get along with some prominent Gurdaspur and Amritsar leaders who have aligned with Amarinder. Brar is opposed by Congress Legislature Party Leader Sunil Jakhar and Rana Gurmeet Singh Sodhi from Ferozepur from where he stood for elections in the last parliamentary poll. The sources said it might be an uphill task for the Amarinder camp to have its way. They said the high command was keen to stem the rot after the party’s lacklustre performance in the MC elections and the humiliating defeat in the Dasuya bypoll. The PCC president did not command the same respect as was in the past. During the MC elections, none of the three party legislators from Ludhiana came to meet him during his campaign tour. Similarly, party leaders displayed a casual attitude while answering summons for the Dasuya bypoll. Congress leaders feel Bajwa is a frontrunner for the PCC presidentship because he is a Lok Sabha MP and the fact that he was also able to ensure the victory of his wife in the assembly poll. His only problem is lack of acceptability in the Majha region, which, the sources said, he was working on and had met some success. An organisation man who earlier took on the Badal family head-on, Brar is seen as an equally strong candidate. Jagmeet was once on the verge of being appointed to the post but he was opposed by state leaders. Also, he has lost successive elections. Besides the top contenders, the search for a consensus candidate could lead to Sanaur MLA Laal Singh. Though not a Jat Sikh, Laal Singh is considered a shrewd politician who can take everyone along with him. He is one of the senior most leaders and has served as acting PCC chief earlier. The Amarinder camp is comfortable with Kharar MLA Jagmohan Kang being appointed to the post. Others in the race include Amloh MLA Randeep Singh and Barnala MLA Kewal Dhillon. Sources said Deputy Chief Minister Sukhbir Singh Badal directed the Chief Secretary to proceed against the Municipal Commissioner last night after an inquiry by the DGP found the Commissioner at fault. This is the second instance when a bureaucrat has been taken to task for misusing power. Earlier, Patiala Deputy Commissioner Vikas Garg was suspended for allowing the sale of government land. The sources said the Deputy CM decided to take a firm action Jaggi to send a message to the bureaucracy that such behavior would not be tolerated. Senior IAS officer Anurag Verma, who has served as Ludhiana Deputy Commissioner earlier, has been appointed the new Commissioner. Jaggi’s wife was apparently peeved at a vegetable vendor in Dandi Swami area of Ludhiana for not attending to her properly. It is alleged that the vendor asked her to pay for the vegetables. This charge is denied by the Commissioner. However, the DGP’s report found that the officer’s wife did leave the vend in anger, threatening to teach its owner a lesson. Following the incident, a corporation demolition squad pulled down the vend. The perplexed owner was asked by a corporation employee to apologise to the Commissioner’s wife, if he wanted to resume business. 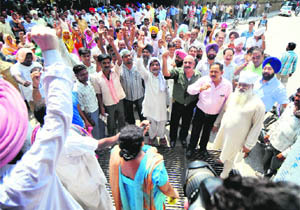 The MC employees have announced an indefinite strike in Jaggi’s support. They want his suspension orders revoked. While the employees, including additional commissioners, joint commissioners and superintendents, held a rally in his support, some Congress MLAs and councillors organised a press conference in the evening and announced their support to the officer. Vijay Danav, chairman, Dalit Vikas Board, said some BJP leaders were behind the incident. “A few days back, BJP leaders led by district president Parveen Bansal had a heated argument with Jaggi at his camp office. We suspect that they may be behind the incident,” Danav alleged. Jaggi too said he did not see BJP’s hand in the incident. “I have faith in the state government. I have learnt that an inquiry has been marked to investigate the matter thoroughly. I have appealed to the MC employees to join duty tomorrow because going on strike will not solve anything. “ I have worked hard as Commissioner and expect a free and fair probe. Even I want the truth to come out in the open and thosee behind the incident to be identified,” Jaggi said over the phone. Chief Minister Parkash Singh Badal today approved the Rs 10,300 crore Ludhiana Metro project, which will be completed in five years. A detailed presentation on the project was made by the Local Government Department and Punjab Infrastructure Development Board in a meeting here, an official release said. It was decided that the land required for execution of the project would be provided by the state government with minimum displacement of people. Emphasis would be on to execute the underground Metro corridor, especially in densely populated areas, though it was capital intensive as compared to fully or partly elevated corridor. But, the prime objective was to avoid undue harassment of people on account of dislocation, officials said. Badal approved the proposal of the Local Government Department for setting up of Special Purpose Vehicle for the smooth and effective implementation of the project. He said Metro would be the only viable solution to provide fast, safe and economic transport system for the public. It was informed in the meeting that two corridors of the Metro will be covering the entire city — one from Ayali Chowk to BBMB Power House and another from Gill village to Rahon Road Chungi — in a total length of about 29 km. A delegation of the All-India Cement Importers Association today met the Commissioner, Customs. Association president MPS Chatha said since wagons were loaded and sealed by the Pakistani customs authorities, Indian officials should take up the matter with them to ensure a strict inspection at the time of loading of the consignment. “We have also requested the Indian authorities to have stringent measures in place like scanners and sniffer dogs for carrying out checks on the consignment from Pakistan.” He said these measures would deter such activities which caused unnecessary harassment to the importers. He said if the trend was not curbed effectively, it might threaten cement import from Pakistan. Chatha said they had also shot off missives to the Prime Minister, Union Finance Minister and the Union Commerce Minister in this regard. CII National Council on Public Policy member Gunbir Singh said these instances had reaffirmed the demand of the traders that instead of carrying out random checks, scanners should be installed to scan the entire consignment. He said the contraband could be put into anybody’s consignment which might lead to harassment of innocent importers. He also reiterated his demand for bringing the rail link with Pakistan under the ambit of the ICP which was 300-400 m away from the rail route. “At present, there are open warehouses which are vulnerable to vagaries of weather, besides being open to any mischief. If these come under the ICP, which is a bounded area, nobody will dare to mess with these,” he averred. A spokesperson for the Confederation of International Chamber of Commerce and Industry (CICCI) said anti-national forces across the border wished to derail and create hurdles in the peaceful business relationships between India and Pakistan. He said the government should find an early solution to the problem so that genuine traders should not suffer. For a job that could have been done by land acquisition collectors of the Housing Department, the government will be paying Rs 30,000 per acre as fee to private consultants to acquire land on behalf of the agency. A senior official said like the Industries Department, that is focusing on creating land banks for the industry in cities like Bathinda, Ludhiana, Banur and Lalru, the Housing Department was contemplating acquiring land for projects in the Urban Estates. “Outsourcing the job would mean little interface between officials and farmers. In the past, there have been complaints of officials showing undue favour to beneficiaries. There have been delays in the land acquisition process, causing losses to the government”, explained the official. Already, the department has allowed single companies to develop roads, sewerage, water supply, stormwater disposal, electricity lines and landscaping on a turnkey basis. On the directions of the Housing Department, the Greater Mohali Area Development Authority (GMADA) has invited bids to outsource the job for future acquisitions. After GMADA, the outsourcing would be extended to the authorities in Ludhiana, Patiala, Jalandhar and Amritsar. The task of identifying land, preparing revenue plans, acquiring revenue record, preparing notifications under Sections 4,5, 6 and 9 and surveying structures would be allotted to consultants, of course under the watchful eyes of government officials. 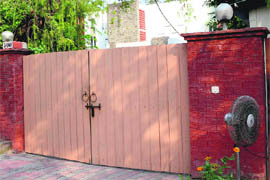 Propriety in spending government funds is being questioned with the Punjab Home Department refusing to clear a bill of more than Rs 81 lakh incurred on the renovation of former DGP PS Gill’s official residence in Sector 16 here. Records show that more than Rs 1.06 crore was spent on renovating the Sector 16 accommodation, allotted to the former DGP a couple of months before he resigned in September last year. Of this total, a little more than Rs 81 lakh was paid by the Punjab Police Housing Corporation. The Home Department has returned the bill to the corporation with certain objections. Anil Kaushik, corporation CMD, said: “We have replied to the objections raised by the Finance Department”. A senior official said: “It is a routine procedure as such bills are cleared after a round of communication between different departments. The real issue is how such a huge expenditure out of corporation funds was allowed at a time when hundreds of police personnel are waiting to get official accommodation”. The former DGP has been occupying the official accommodation even after relinquishing the charge and despite the levy of a penal rent of Rs 55,000 per month on him. Since the accommodation is official, the officer was required to leave the premises immediately after he resigned, sources said. Prerna Puri, secretary, UT’s House Allotment Committee, said: “We have received a formal communication from the Punjab Government that the present DGP, Sumedh Singh Saini, will be shifting to his official accommodation soon. We have already initiated eviction proceedings against the former DGP”. The DC said a target was fixed to increase the forest cover in Patiala district from 7 per cent to 15 per cent in the next five years and nearly 25 lakh saplings would be planted during this year. He said a special room would be constructed inside the jail for prisoners to discuss cases with their advocates. Waterlogging is a big problem during rainy seasons in the university, especially in areas around the engineering hostel and staff quarters. University Registrar Dr AS Chalwa said there were a few complaints following which the university decided to solve the problem for once and all. “This plant will have several benefits. This will not only solve the problem of waterlogging but the recycled water will be used for gardening and other purposes,” he added. A slew of directions, including instructions for the complainant’s protection, have been issued by Justice Ranjit Singh, while recommending a day-to-day trial in the case allegedly involving Mohit Sharma, son of “influential police officer” Shiv Kumar Sharma. The case of robbery and other offences was registered on the complaint of Mumbai resident Bhavesh Navin Shah on October 8, 2009. Sharma was then serving as Superintendent of Police, Patiala Vigilance Bureau. Mohit allegedly took Shah to a house he was reportedly sharing with his father. The complainant showed Mohit the diamonds before the gems were robbed. “The diamonds were later recovered from the same house, where Shiv Kumar Sharma was also residing”. Initially, the court was told that Sharma had retired in March 2010. “What was disclosed subsequently was rather disturbing,” Justice Ranjit Singh ruled. Asked to file an affidavit, the state revealed that Sharma had retired as SP. But the fact of the matter was that he was re-employed on a contract basis and posted as SSP, Patiala Vigilance Bureau. Justice Ranjit Singh observed the fact that Sharma was re-employed and made in charge “indicates he has real clout with the power center”. Justice Ranjit Singh added: “It is but natural that a police officer, whose son is involved in such a serious offence, would with or without intend render assistance to his son. “The ever-obliging police officers cannot be expected to insulate themselves from the influence of their senior officer, who notably has connections with the high-ups”. Justice Ranjit Singh ruled that it would be appropriate for the Sessions Judge to hear the case himself and “to consider if the trial has ever been influenced in any unfair manner” and if re-examination of any witness was required”. Behind bars in the Harpreet abduction and forcible abortion case, Bibi has sought two days’ interim bail for voting. Her bail petition could not be taken up yesterday as one of the Judges in a Division Bench recused himself from hearing the case. Information to this effect has been furnished to the Punjab and Haryana High Court. The matter was brought to the High Court’s notice through an application by Manmeet Singh, confined in the Ludhiana Central Jail. On February 21 last year, the Punjab Home Secretary was asked to initiate an inquiry after the Ludhiana District and Sessions Judge confirmed in his report that the undertrial had suffered injuries while in custody. In an affidavit filed subsequently, the State of Punjab stated that inquiries conducted by the Ludhiana SDM and the Home Department had found a Head Constable and a constable guilty of inflicting injuries on the petitioner. The High Court was also told that Ludhiana Commissioner of Police had in a letter dated July 26, 2011, intimated that departmental proceedings had been initiated against the guilty officials. Taking up the matter, the High Court observed that directions were issued on January 24 to have the complainant examined by an orthopaedic surgeon. “Despite the directions of the court, the complainant was not subjected to any x-ray and medical examination by an orthopaedic,” the Bench added. In its detailed order, the Bench said an action-taken report by way of affidavit had been placed before the court, stating that as punishment, Head Constables Balbir Singh and Dharminder Kumar had been denied two increments. “So far as the Superintendent, Central Jail, Ludhiana, is concerned, pursuant to the charge sheet issued to him, an inquiry is on and action shall be taken in accordance with the provisions of law on completion of the inquiry report,” the Bench asserted. “It is directed that the jail authorities shall provide medical aid to complainant Manmeet Singh as and when needed”, the Bench said. According to a complaint by one of their relatives, Balwinder Singh, a resident of nearby Duneke village, went to Canada in 1996. Later, he married Jaswinder Kaur, who, after getting a passport issued in the name of Gurkartar Kaur, too went to Canada. Jaswinder also used forged documents to get Canadian citizenship. A case has been registered against them at the NRI police station. A look-out notice has also been issued against the couple at all international airports in the country while their son was eluding arrest, said a police officer. Addressing mediapersons here today, Senior Superintendent of Police (SSP) Gurpreet Singh Gill said on May 22, 2009, the police had recovered two bodies from near the Sirhind Road. “Initially, we thought it was a case of an accident but the postmortem report revealed that the two deceased had injury marks, following which we registered a case pertaining to murder,” he said. However, in the absence of identity proofs of the victims, the case remained unsolved till recently. “Recently, we identified the victims as Jalandhar residents Subhash Kumar and Happy alias Alla who had come to Patiala with their friends Ajaypal Singh Nihang, Salim Kumar and Gurpreet Singh,” said the SSP. Investigations revealed that the trio murdered Subhash and Alla following a tiff after drinks. “They all consumed liquor and following an altercation that later turned bloody, the three friends killed the other two and left them on the road to give the impression of being road accident victims. They took away all their belongings so that the police could not identify the dead,” Gill added.